The ghost of Evan Morgan, the last Viscount Tredegar, still haunts the stately home bearing his titled name. "Sometimes when I'm alone here I have a feeling that Evan, with his tall, angular body and beak of a nose that made him look like one of the birds he loved so much, is going to appear." Paul Busby says. "The answer is that he was a Walter Mitty character, a man who wanted to be a Roman Catholic priest, a novelist, painter, journalist and poet. Evan was at the centre of the bohemian network that included Augustus John and Dylan Thomas, H.G. Wells and the infamous satanist Aleister Crowley, and himself took a deep interest in black magic. "He has been condemned as the Morgan who frittered away the family fortune, but the real culprits were war and the Great Depression, death duties and the changing pattern of life." Paul Busby's storehouse of knowledge about the Morgan dynasty, and Evan in particular, will be unlocked before an audience at the Reardon Smith Theatre, which is part of the National Museum in Cardiff, on February 25. "Most people in Gwent know something about Sir Charles and Godfrey Morgan, who were the benefactors of modern Newport and of a lineage going back to 1290. Evan, the last viscount, is completely different from his hunting, shooting and fishing forebears and undoubtedly took some of his eccentricity from his mother, Katherine. "Godfrey Wynn, the journalist, used to tell of how, after dinner, Katherine would summon a footman who would appear with a tray filledwith moss and hair and bits of twig and begin to assemble birds' nests. When finished, she would put the nests up in trees. She also built a nest for herself and held court from it." An obsession with the Morgans stole upon Newport-born Paul, 27, quite slowly. "While at St Joseph's School I used to play football and cricket inthe grounds of Tredegar House without setting foot in it. It was when I got a summer job as a guide that my interest really took off. After Plymouth University, where I read history, I was drawn back to the house and into a deep fascination with Evan and the other Morgans. "He was certainly capable of the most extraordinary things. 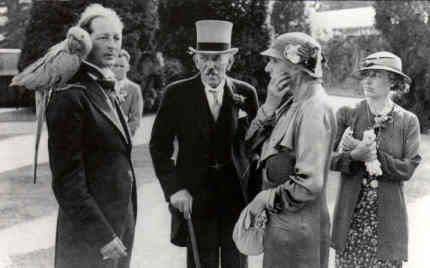 As late as the 1930s he brought back powdered wigs for his footmen and, at a party for the Princess Royal, engaged four footmen with the names Mr North, Mr South, Mr East and Mr West." His poetry is dreadful. He wrote a novel entitled 'Trial by Ordeal', the best review of which said, 'this is a very dull book.'" By the very nature of its contents Paul Busby's planned biography of Evan is unlikely to be anything other than spellbinding. "Evan Morgan wasn't on the edges of the bohemian world of the 20sand 30s, he was right in the thick of it. One thing he could do really well was to tame birds. Tredegar House was at one time full of exotic birds and animals, including a parrot that habitually attacked HG Wells. "Evan was charismatic, eccentric, totally unpredictable and a fantasist. If you wanted to know anything about Evan Morgan, the last person to ask was Evan Morgan."